Chemical warfare agents containing phosphonate ester bonds are among the most toxic chemicals ever created. Solutions are needed for immediate personal protection (for example, the filtration and catalytic destruction of airborne versions of agents), bulk destruction of chemical weapon stockpiles, protection (via coating) of clothing, equipment and buildings, and containment of agent spills. 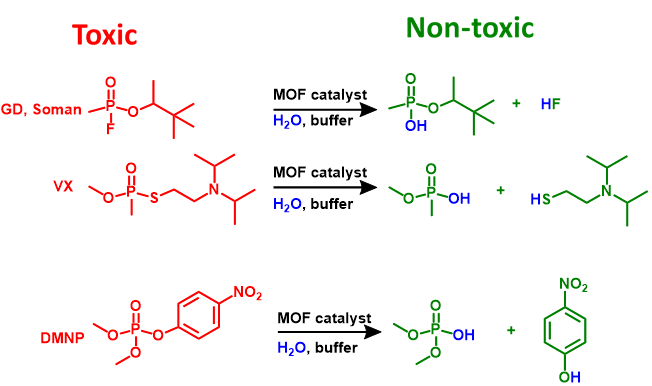 The selective, hydrolytic cleavage of the P—F bond of organophosphonate based nerve agents is effective for chemical detoxification of these agents. P—F bond cleavage with cationic Lewis acids is particularly promising as phosphonate ester hydrolysis can be accelerated by polarizing the P═O bond. In the Farha group, we design/identify metal-organic frameworks (MOFs) that can effectively catalyze the important reactions shown above. We fine tune chemical (i.e. metal, functional groups etc.) and/or physical properties (node connectivity, topology, pore size, particle size etc.) 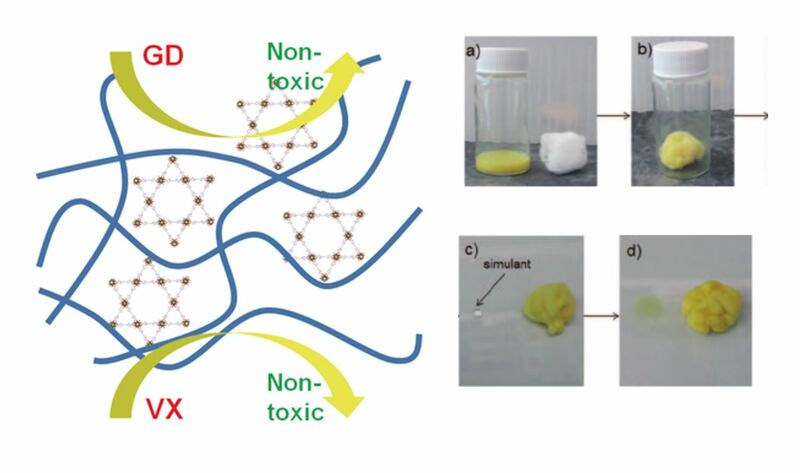 of the MOFs and monitor the reactivity towards a nerve agent simulant, DMNP, in our lab, and towards actual nerve agents such as VX and GD in collaboration with US. Army Research labs. We have developed materials that show almost instantaneous hydrolysis of these toxic chemicals using catalytic amounts of MOFs. “Destruction of chemical warfare agents using metal–organic frameworks.” Mondloch, J. E.; Katz, M. J.; Isley Iii, W. C.; Ghosh, P.; Liao, P.; Bury, W.; Wagner, G. W.; Hall, M. G.; DeCoste, J. B.; Peterson, G. W.; Snurr, R. Q.; Cramer, C. J.; Hupp, J. T.; Farha, O. K., Nat. Mater. 2015, 14, (5), 512-516. 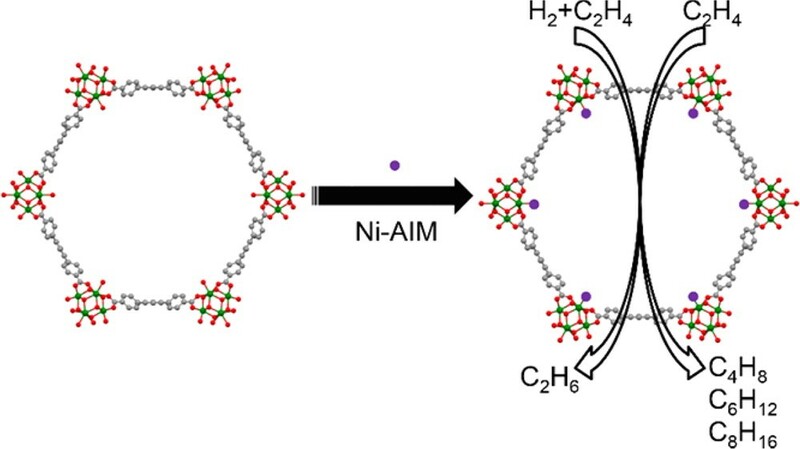 “Instantaneous Hydrolysis of Nerve‐Agent Simulants with a Six‐Connected Zirconium‐Based Metal–Organic Framework.” Moon, S. Y.; Liu, Y.; Hupp, J. T.; Farha, O. K., Angew. Chem. Int. Ed. 2015, 54, (23), 6795-6799. “Cerium(IV) vs Zirconium(IV) Based Metal-Organic Frameworks for Detoxification of a Nerve Agent.” Islamoglu, T.; Atilgan, A.; Moon, S. Y.; Peterson, G. W.; DeCoste, J. B.; Hall, M.; Hupp, J. T.; Farha, O. K., Chem. Mater. 2017, 29, (7), 2672-2675. “Dual-Function Metal–Organic Framework as a Versatile Catalyst for Detoxifying Chemical Warfare Agent Simulants.” Liu, Y.; Moon, S.-Y. ; Hupp, J. T.; Farha, O. K., ACS Nano 2015, 9, (12), 12358-12364. 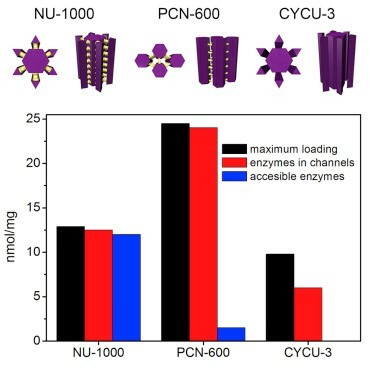 “Nanosizing a Metal–Organic Framework Enzyme Carrier for Accelerating Nerve Agent Hydrolysis.” Li, P.; Moon, S.-Y. ; Guelta, M. A.; Lin, L.; Gómez-Gualdrón, D. A.; Snurr, R. Q.; Harvey, S. P.; Hupp, J. T.; Farha, O. K., ACS Nano 2016, 10, (10), 9174-9182. “Detoxification of Chemical Warfare Agents Using a Zr6-Based Metal–Organic Framework/Polymer Mixture.” Moon, S.-Y. ; Proussaloglou, E.; Peterson, G. W.; DeCoste, J. B.; Hall, M. G.; Howarth, A. J.; Hupp, J. T.; Farha, O. K., Chem–Eur. J. 2016, 22, (42), 14864-14868. 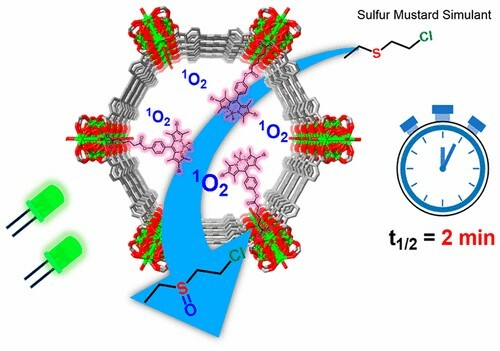 “Simple and Compelling Biomimetic Metal-Organic Framework Catalyst for the Degradation of Nerve Agent Simulants.” Katz, M. J.; Mondloch, J. E.; Totten, R. K.; Park, J. K.; Nguyen, S. T.; Farha, O. K.; Hupp, J. T., Angew. Chem. Int. Ed 2014, 53, (2), 497-501. The continued prevalence of chemical warfare agents (CWAs) as weapons of mass destruction (WMD) and in stockpile materials necessitates the development of materials capable of rapid detoxification of these chemicals.Among the commonly used CWAs, sulfur mustard (also known as mustard gas or HD) incapacitates its victims by causing painful blisters and irreversible tissue damage. We have found oxidation of HD to the nontoxic sulfoxide derivative is a viable detoxification pathway. The challenge of this oxidation occurs with over-oxidation to the sulfone derivative, which has similar toxic properties as the parent HD; therefore, the reaction must selectively yield the sulfoxide. 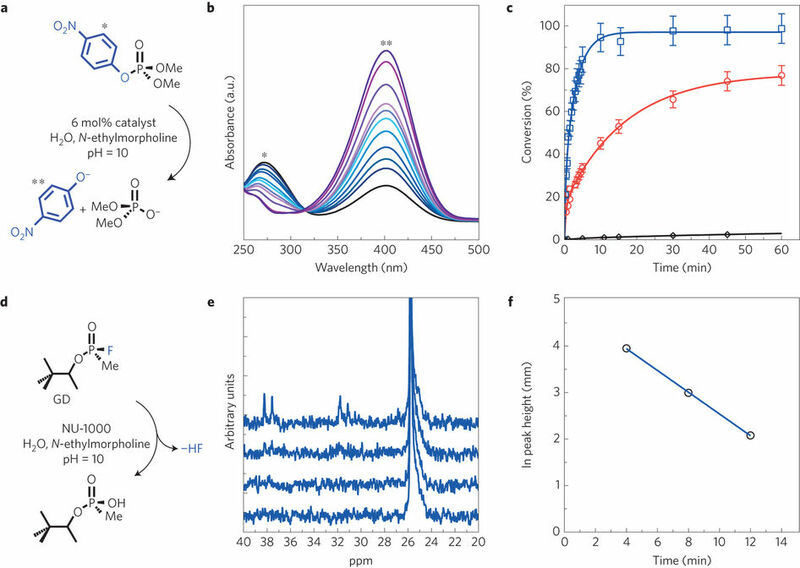 In the Farha group, we have taken two approaches for the rapid, selective oxidation of HD: 1) using MOF linkers and ligands as photosensitizers to generate singlet oxygen from atmospheric oxygen upon LED irradiation and 2) installing soluble, but catalytically active polyoxometalates (POMs) in a MOF to activate hydrogen peroxide or atmospheric oxygen. At Northwestern, we test these materials using simulants, chemicals with similar properties as CWA but much less toxic; our collaborators have capabilities allowing them to test our materials against the real agents. Because the linkers and the installation of POMs leave the MOF node untouched, HD oxidation can be coupled with the decomposition of toxic organophosphate nerve agents, a reaction which occurs on the MOF nodes. We wish to continue developing new materials and composites to achieve the ultimate catalyst for CWA detoxification. 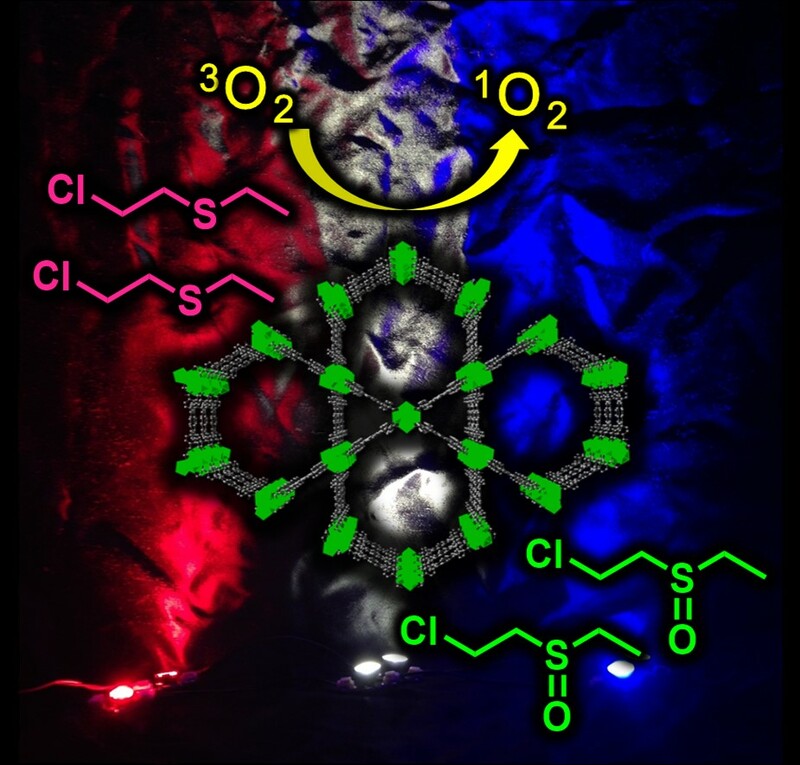 “Postsynthetic Incorporation of a Singlet Oxygen Photosensitizer in a Metal–Organic Framework for Fast and Selective Oxidative Detoxification of Sulfur Mustard” Howarth, A. J.; Buru, C. T.; Liu, Y.; Ploskonka, A. M.; Hartlieb, K. J.; McEntee, M.; Mahle, J. J.; Buchanan, J. H.; Durke, E. M.; Al-Juaid, S. S.; Stoddart, J. F.; DeCoste, J. B.; Hupp, J. T.; Farha, O. K., Chemistry – A European Journal 2017, 23, 214-218. 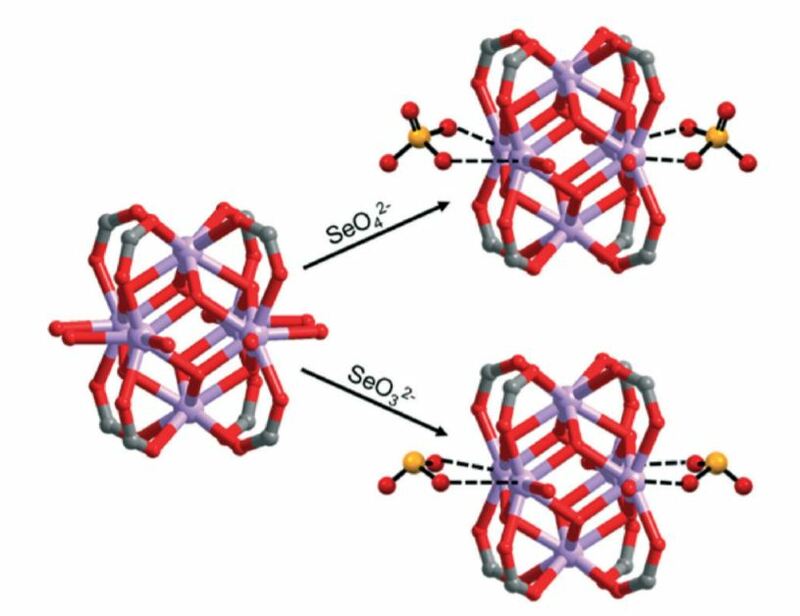 “Efficient and selective oxidation of sulfur mustard using singlet oxygen generated by a pyrene-based metal-organic framework” Liu, Y.; Buru, C. T.; Howarth, A. J.; Mahle, J. J.; Buchanan, J. H.; DeCoste, J. B.; Hupp, J. T.; Farha, O. K., Journal of Materials Chemistry A 2016, 4, 13809-13813. “Selective Photooxidation of a Mustard-Gas Simulant Catalyzed by a Porphyrinic Metal–Organic Framework” Liu, Y.; Howarth, A. J.; Hupp, J. T.; Farha, O. K., Angew. Chem. Int. Ed. 2015, 54, 9001-9005. “Adsorption of a catalytically accessible polyoxometalate in a channel-type metal-organic framework.” Buru, C. T.; Li, P.; Mehdi, B. L.; Dohnalkova, A.; Platero-Prats, A. E.; Browning, N. D.; Chapman, K. W.; Hupp, J. T.; Farha, O. K. Chem. Mater. 2017, 29 (12), 5174–5181. “Detoxification of a Sulfur Mustard Simulant Using a BODIPY- Functionalized Zirconium-Based Metal − Organic Framework.” Atilgan, A.; Islamoglu, T.; Howarth, A. J.; Hupp, J. T.; Farha, O. K. ACS Appl. Mater. Interfaces 2017, 9 (29), 24555–24560. 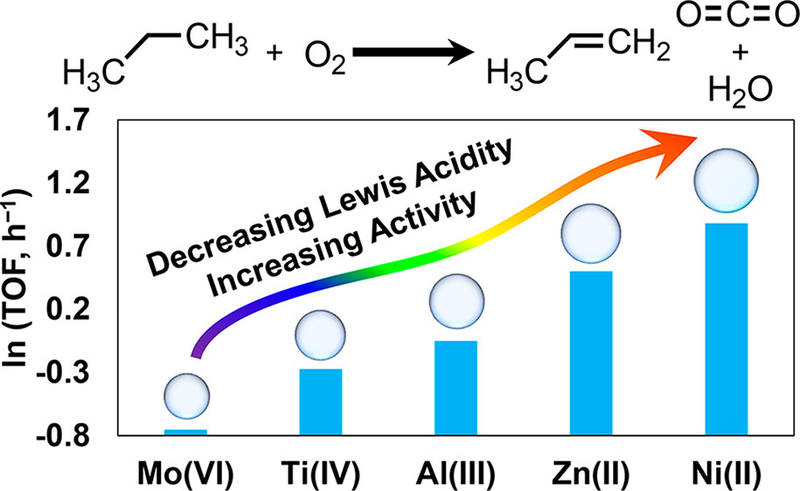 “Catalytic degradation of chemical warfare agents and their simulants by metal-organic frameworks” Liu, Y.; Howarth, A. J.; Vermeulen, N. A.; Moon, S.-Y. ; Hupp, J. T.; Farha, O. K., Coord. Chem. Rev. 2017, 346, 101-111. 1) Develop efficient de novo and post-modification immobilization strategies to prepare stable and biocompatible inorganic/organic/biological hybrid materials. 2) Study the diffusion, accessibility, and reactivity of biomolecules confined in the nanospace of well-defined porous crystalline materials. 3) Investigate the stability of the encapsulated enzymes and their ability to withstand pH changes, temperature swings and toxic intermediates formed during biocatalysis. “Nanosizing a Metal-Organic Framework Enzyme Carrier for Accelerating Nerve Agent Hydrolysis.” Li, P.; Moon, S.-Y. ; Guelta, M. A.; Lin, L.; Gómez-Gualdrón, D. A.; Snurr, R. Q.; Harvey, S. P.; Hupp, J. T.; Farha, O., ACS Nano 2016, 10, 9174–9182. 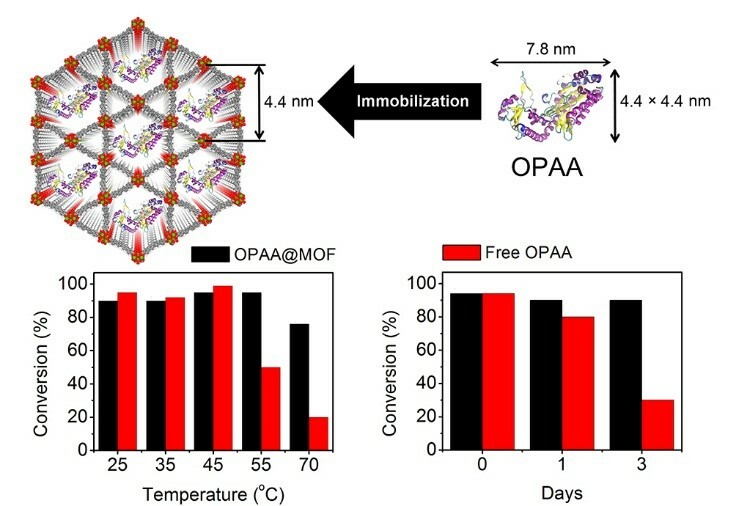 “Encapsulation of a Nerve Agent Detoxifying Enzyme by a Mesoporous Zirconium Metal-Organic Framework Engenders Thermal and Long-Term Stability.” Li, P.; Moon, S.-Y. ; Guelta, M. A.; Harvey, S. P.; Hupp, J. T.; Farha, O. K., Am. Chem. Soc. 2016, 138 (26), 8052-8055. DOI: 10.1021/jacs.6b03673. 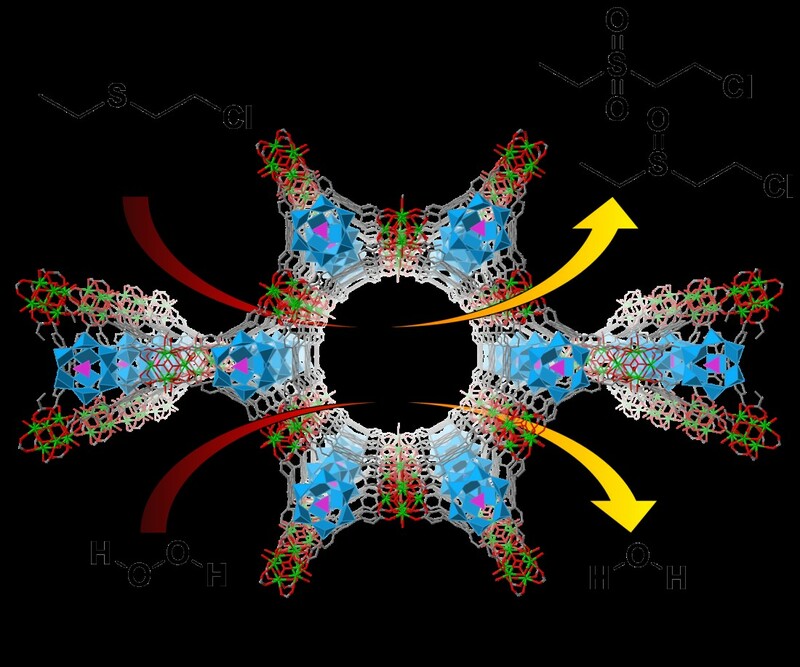 “Toward Design Rules for Enzyme Immobilization in Hierarchical Mesoporous Metal-Organic Frameworks.” Li, P.; Modica, J. A.; Howarth, A. J.; Vargas, E.; Moghadam, P. Z.; Snurr, R. Q.; Mrksich, M.; Hupp, J. T.; Farha, O. K., Chem 2016, 1 (1), 154-169. 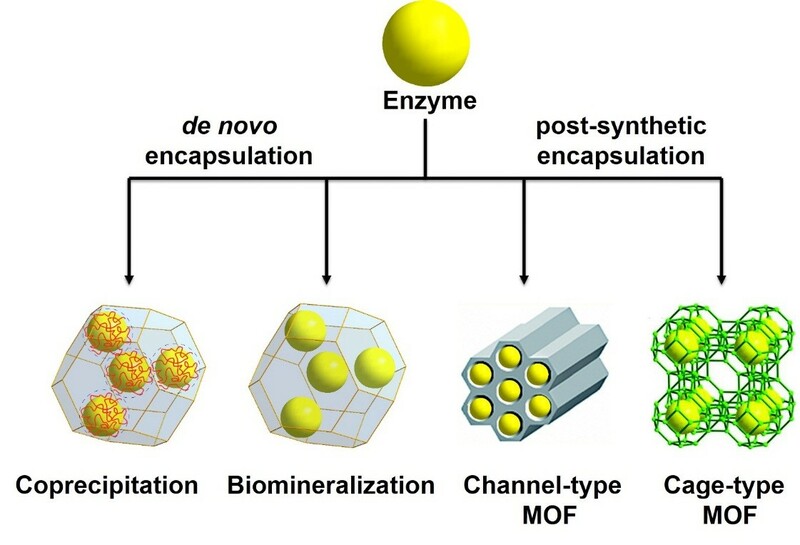 “Enzyme Encapsulation in Metal–organic Frameworks for Applications in Catalysis.” Majewski, M. B.; Howarth, A. J.; Li, P.; Wasielewski, M. R.; Hupp, J. T.; Farha, O. K., CrystEngComm 2017, 19, 4082-4091. 1) Synthesize and characterize novel actinides-based materials. 2) Understand the chemical bonding and processes that govern the formation of actinide-based materials. 3) Customize and tailor functional actinides-based materials on demand. “Bottom-up construction of a superstructure in a porous uranium-organic crystal” Li, P.; Vermeulen, N. A.; Malliakas, C. D.; Gómez-Gualdrón, D. A.; Howarth, A. J.; Mehdi, B. L.; Dohnalkova, A.; Browning, N. D.; O’Keeffe, M.; Farha, O. K., Science 2017, 356, 624-627. 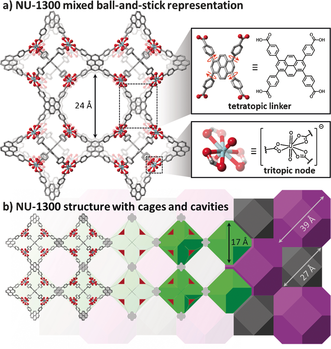 “Design and Synthesis of a Water-Stable Anionic Uranium-Based Metal–Organic Framework (MOF) with Ultra Large Pores” Li, P.; Vermeulen, N. A.; Gong, X.; Malliakas, C. D.; Stoddart, J. F.; Hupp, J. T.; Farha, O. K., Angew. Chem. 2016,128, 10514-10518. In the Farha group, we have been developing new synthetic methodologies for metal-organic frameworks (MOF). Through judicious choice of components and synthetic conditions, materials with permanent porosity and interesting functionality can be prepared.While the modular nature of MOFs allows for designing functional MOFs using de novo synthesis, there are conditions where desired functionality is very challenging to introduce using direct synthetic methods. In these cases, we have developed post-synthesis crystal engineering methods to access preferred functionalities. These techniques include methods for functionalizing MOF nodes, i.e., solvent-assisted ligand incorporation (SALI) and atomic layer deposition in MOFs (AIM) as well as solvent-assisted linker exchange (SALE), a method to replace structural linkers. We continue to pioneer novel synthetic methodologies which allow us to access MOFs with novel topological properties with atomic precision. “Vapor-Phase Metalation by Atomic Layer Deposition in a Metal–Organic Framework” Mondloch, J. E.; Bury, W.; Fairen-Jimenez, D.; Kwon, S.; DeMarco, E. J.; Weston, M. H.; Sarjeant, A. A.; Nguyen, S. T.; Stair, P. C.; Snurr, R. Q.; Farha, O. K.; Hupp, J. T., J. Am. Chem. Soc. 2013, 135, 10294-10297. “Perfluoroalkane Functionalization of NU-1000 via Solvent-Assisted Ligand Incorporation: Synthesis and CO2 Adsorption Studies” Deria, P.; Mondloch, J. E.; Tylianakis, E.; Ghosh, P.; Bury, W.; Snurr, R. Q.; Hupp, J. T.; Farha, O. K., J. Am. Chem. Soc. 2013, 135, 16801-16804. “Opening ZIF-8: a catalytically active zeolitic imidazolate framework of sodalite topology with unsubstituted linkers.” Karagiaridi, O.; Lalonde, M. B.; Bury, W.; Sarjeant, A. A.; Farha, O. K.; Hupp, J. T., J. Am. Chem. Soc. 2012, 134, 18790-6. “Metal-organic framework materials with ultrahigh surface areas: is the sky the limit?” Farha, O. K.; Eryazici, I.; Jeong, N. C.; Hauser, B. G.; Wilmer, C. E.; Sarjeant, A. A.; Snurr, R. Q.; Nguyen, S. T.; Yazaydin, A. O.; Hupp, J. T., J. Am. Chem. Soc. 2012, 134, 15016-21. “Postsynthetic Tuning of Metal–Organic Frameworks for Targeted Applications” Islamoglu, T.; Goswami, S.; Li, Z.; Howarth, A. J.; Farha, O. K.; Hupp, J. T., Acc. Chem. Res. 2017, 50, 805-813. Catalysts composed of small metal/metal-oxide crystallites well dispersed on porous solid materials, play essential roles in a variety of industrial gas-phase catalytic reactions including steam reforming, Fischer–Tropsch, and Haber–Bosch processes. As compared to conventional supports, the structures of MOFs, a class of porous materials comprised of organic linkers and inorganic nodes, are more readily tuned by rational ligand design. Furthermore, using crystalline MOFs as supports provides opportunities for atomically precise structural characterization of both active sites and supports, thereby facilitating detailed mechanistic studies of reactions. 2) atomic layer deposition in a MOF (AIM). New MOF designs with other functionalities and enhanced stabilities are also being pursued. The targeted catalysis is mainly gas-phase transformations, including alkene hydrogenation and oligomerization, alkane oxidative dehydrogenation, and selective oxidation of alkanes to alcohols. Collaborating with beamline scientists at Argonne National Lab and theorists, we correlate the catalytic activity/product distribution with active-site structures to lay out the design rules for the discovery of improved catalysts. 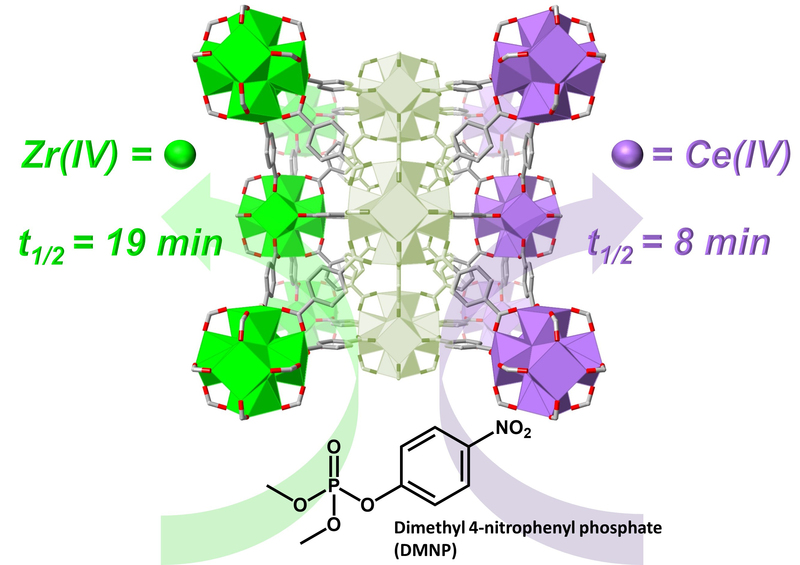 “Fine-Tuning the Activity of Metal–Organic Framework-Supported Cobalt Catalysts for the Oxidative Dehydrogenation of Propane.” Li, Z.; Peters, A. W.; Platero-Prats, A. E.; Liu, J.; Kung, C.-W.; Noh, H.; DeStefano, M. R.; Schweitzer, N. M.; Chapman, K. W.; Hupp, J. T.; Farha, O. K. Am. Chem. Soc. 2017, 139, 15251–15258. “Metal–Organic Framework Supported Cobalt Catalysts for the Oxidative Dehydrogenation of Propane at Low Temperature” Li, Z.; Peters, A. W.; Bernales, V.; Ortuño, M. A.; Schweitzer, N. M.; DeStefano, M. R.; Gallington, L. C.; Platero-Prats, A. E.; Chapman, K. W.; Cramer, C. J.; Gagliardi, L.; Hupp, J. T.; Farha, O. K. ACS Cent. Sci. 2017, 3, 31. “Sintering-Resistant Single-Site Nickel Catalyst Supported by Metal–Organic Framework” Li, Z.; Schweitzer, N. M.; League, A. B.; Bernales, V.; Peters, A. W.; Getsoian, A.; Wang, T. C.; Miller, J. T.; Vjunov, A.; Fulton, J. L.; Lercher, J. A.; Cramer, C. J.; Gagliardi, L.; Hupp, J. T.; Farha, O. K. , Am. Chem. Soc. 2016, 138, 1977–1982. 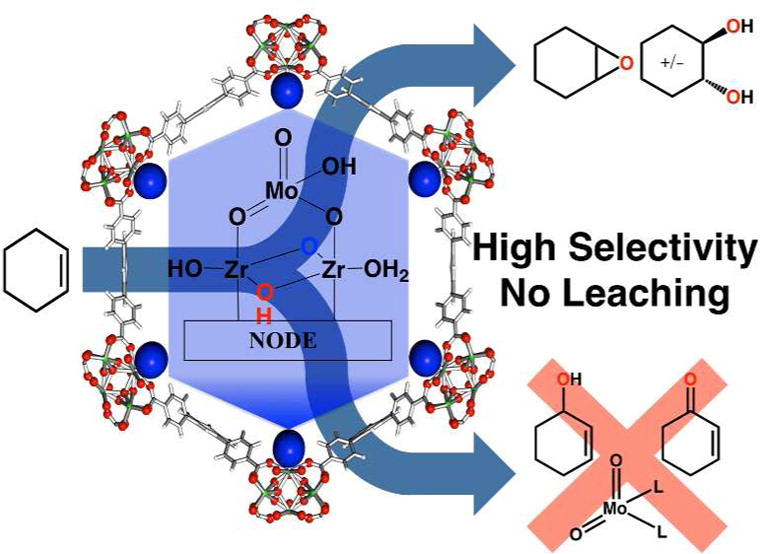 “An Exceptionally Stable Metal–Organic Framework Supported Molybdenum(VI) Oxide Catalyst for Cyclohexene Epoxidation” Noh, H.; Cui, Y. X.; Peters, A. W.; Pahls, D. R.; Ortuno, M. A.; Vermeulen, N. A.; Cramer, C. J.; Gagliardi, L.; Hupp, J. T.; Farha, O. K., Am. Chem. Soc. 2016, 138, 14720–14726. “Stable Metal–Organic Framework Supported Niobium Catalysts” Ahn, S.; Thornburg, N. E.; Li, Z. Y.; Wang, T. C.; Gallington, L. C.; Chapman, K. W.; Notestein, J. M.; Hupp, J. T.; Farha, O. K. , Chem. 2016, 55, 11954–11961. “Atomic Layer Deposition in a Metal–Organic Framework: Synthesis, Characterization, and Performance of a Solid Acid” Rimoldi, M.; Bernales, V.; Borycz, J.; Vjunov, A.; Gallington, L. C.; Platero-Prats, A. E.; Kim, I. S.; Fulton, J. L.; Martinson, A. B. F.; Lercher, J. A.; Chapman, K. W.; Cramer, C. J.; Gagliardi, L.; Hupp, J. T.; Farha, O. K. , Chem. of Mater. 2017, 29, 1058–1068. Clean water is becoming increasingly scarce and it is imperative we develop cost-efficient technologies capable of remediating large bodies of contaminated water. Rapid industrialization and agricultural growth in nations with minimal environmental regulations have caused extensive pollution. The presence of heavy metals such as lead and arsenic in what supplies is unacceptably common. And after several decades, the global environment is still recovering from the development, testing, and use of nuclear weapons during World War II and the Cold War. 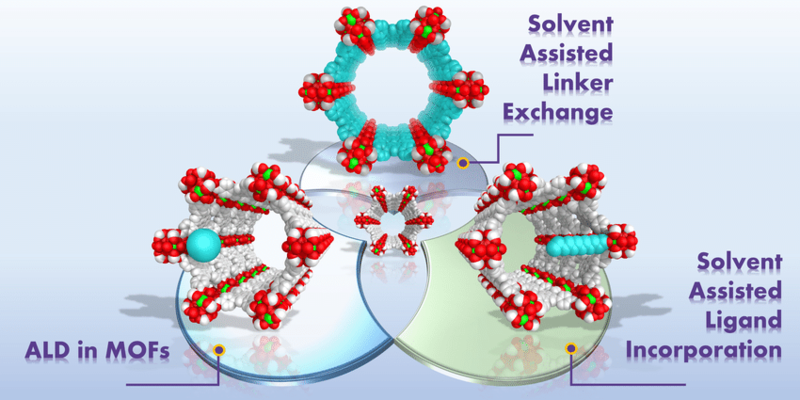 In the Farha group, we are combating water contamination using metal-organic frameworks (MOFs) by capitalizing on unique functionality at 1) the metal node and 2) the organic linker. We also use MOFs as scaffolds to probe individual characteristics that contribute to selective contaminant capture. The permanent crystallinity of MOFs and the ability to grow high-quality crystals allows for the characterization of binding motifs and mechanisms by crystallographic techniques. We will continue to develop new materials with specific applications in water purification. “High efficiency adsorption and removal of selenate and selenite from water using metal-organic frameworks.” Howarth, A. J.; Katz, M. J.; Wang, T. C.; Platero-Prats, A. E.; Chapman, K. W.; Hupp, J. T.; Farha, O. K., J. Am. Chem. Soc. 2015, 137, (23), 7488-94. 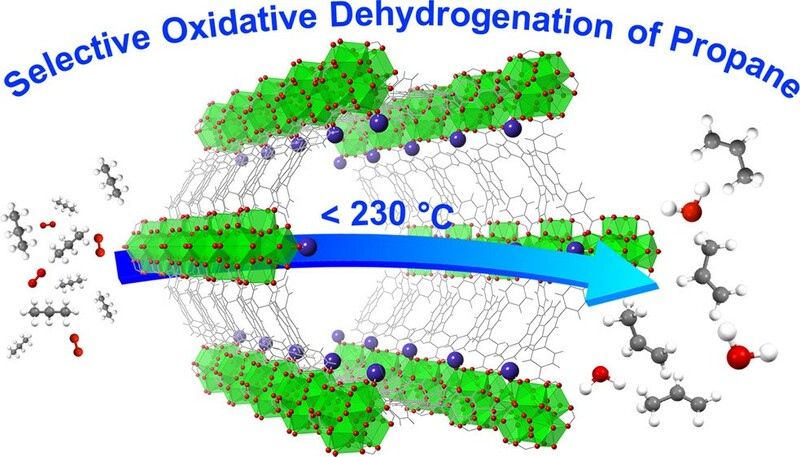 “Metal-organic frameworks for applications in remediation of oxyanion/cation-contaminated water.” Howarth, A. J.; Liu, Y. Y.; Hupp, J. T.; Farha, O. K., CrystEngComm 2015, 17, (38), 7245-7253. 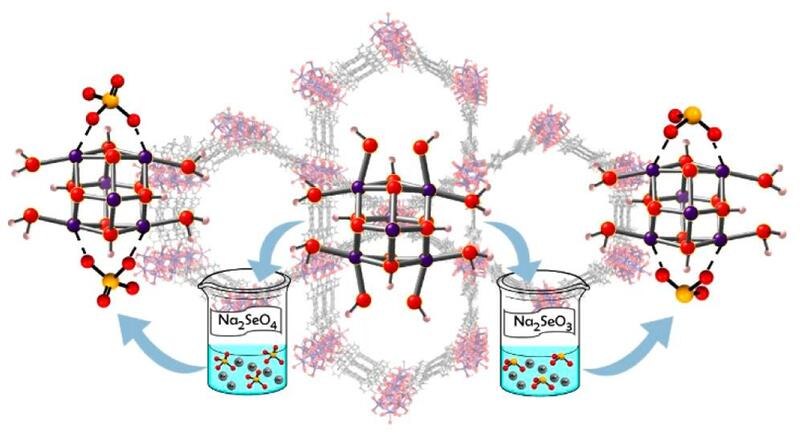 “Efficient extraction of sulfate from water using a Zr-metal-organic framework.” Howarth, A. J.; Wang, T. C.; Al-Juaid, S. S.; Aziz, S. G.; Hupp, J. T.; Farha, O. K., Dalton Trans. 2016, 45, (1), 93-7. “The dual capture of AsV and AsIII by UiO-66 and analogues” Audu, C. O.; Nguyen, H. G. T.; Chang, C. Y.; Katz, M. J.; Mao, L.; Farha, O. K.; Hupp, J. T.; Nguyen, S. T., . Chem Sci 2016, 7, (10), 6492-6498. Metal–organic frameworks (MOFs) are an intriguing class of hybrid materials that are built by assembling metal centers with organic linkers. Through judicious choice of components, materials with permanent nanoscale porosity can be prepared. Some of the most notable examples have large internal surface areas and ultralow densities, with uniform cavities and voids with pre-designed molecular dimensions. These intriguing properties make them excellent candidates for small molecule storage and separation applications. The precise knowledge about the molecular structure of MOFs makes it possible to use highly accurate computational modeling of the static and dynamic interactions of guest molecules in the MOF pores to calculate adsorption isotherms, binding energies, and transport behavior, in both predictive and explanative modes. In Farha group, we design and synthesize MOFs with desired properties to store gases such as methane, hydrogen, oxygen or carbon dioxide, or separate industrially relevant gases. “Metal–Organic Frameworks for Oxygen Storage.” DeCoste, J. B.; Weston, M. H.; Fuller, P. E.; Tovar, T. M.; Peterson, G. W.; LeVan, M. D.; Farha, O. K., Angew. Chem. Int. Ed. 2014, 53, 14092-14095. “Methane storage in metal-organic frameworks: current records, surprise findings, and challenges” Peng, Y.; Krungleviciute, V.; Eryazici, I.; Hupp, J. T.; Farha, O. K.; Yildirim, T., J. Am. Chem. Soc. 2013, 135, 11887-94. “De novo synthesis of a metal-organic framework material featuring ultrahigh surface area and gas storage capacities.” Farha, O. K.; Yazaydin, A. O.; Eryazici, I.; Malliakas, C. D.; Hauser, B. G.; Kanatzidis, M. G.; Nguyen, S. T.; Snurr, R. Q.; Hupp, J. T., Nat Chem 2010, 2, 944-8. 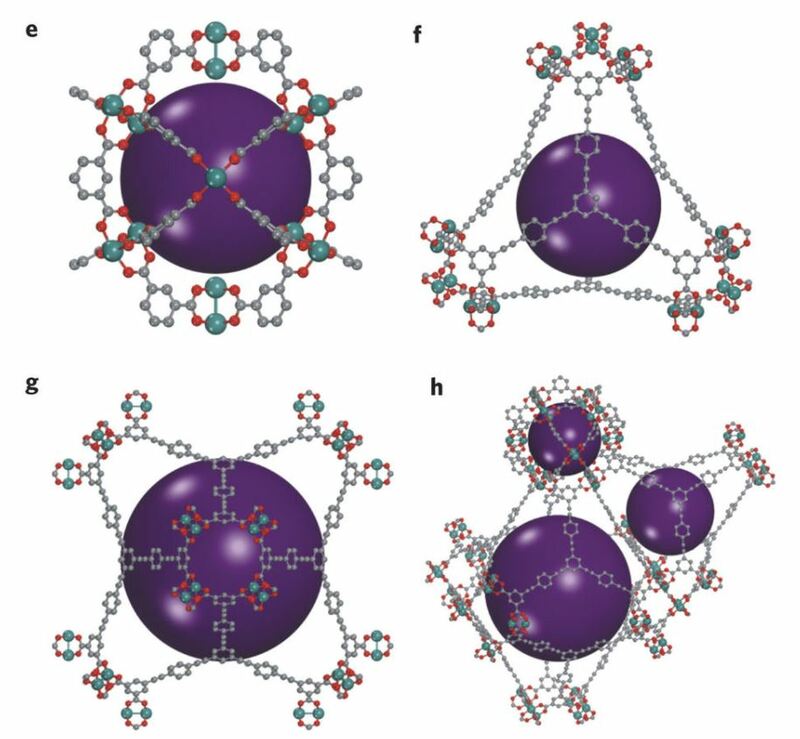 “Isoreticular Series of (3,24)-Connected Metal–Organic Frameworks: Facile Synthesis and High Methane Uptake Properties.” Barin, G.; Krungleviciute, V.; Gomez-Gualdron, D. A.; Sarjeant, A. A.; Snurr, R. Q.; Hupp, J. T.; Yildirim, T.; Farha, O. K., Chem. Mater. 2014, 26, 1912-1917. Chemical separations typically leverage the different physical and chemical properties of the species in the mixture to isolate one compound. Some properties, like boiling point, have been used for centuries to purify compounds, but distillation is an energy-intensive and expensive technique on an industrial scale. MOFs have been shown to serve as capable agents for separation technology, often relying on changes in pore size or Lewis basic sites to isolate the desired molecules. We are interested in leveraging the tunability of MOFs to study how the three-dimensional structure of these materials impacts their performance in challenging, shape-selective separations. In addition, we are investigating “reactive-separations” that utilize MOF-based catalysts to simplify a ternary mixture to a binary mixture that can be separated based on traditional absorbance-based techniques. “Insights into Supramolecular Sites Responsible for Complete Separation of Biomass-Derived Phenolics and Glucose in Metal–Organic Framework NU-1000” Yabushita, M.; Li, P.; Durkin, K. A.; Kobayashi, H.; Fukuoka, A.; Farha, O. K.; Katz, A., Langmuir 2017, 33, 4129-4137. “Complete furanics-sugar separations with metal-organic framework NU-1000” Yabushita, M.; Li, P.; Kobayashi, H.; Fukuoka, A.; Farha, O. K.; Katz, A., Chem. Commun. 2016, 52, 11791-11794.